This post is in collaboration with and sponsored by Ulta Beauty. It’s time to go back to school…for some of you 😉 Not me ladies and gents. I haven’t been in school since 2013. Thank goodness for that. I am so not a student type of person. Some people really rock it, and love to study, but I always found that tests were trying to trick me. It’s not that I didn’t like memorizing everything, and learning about history, art, or math. It’s just that I don’t like being tested. I’m not the best under pressure, especially in a test scenario. Is it A, B, C? Or is it A AND C? Or is it just B and C? Come on people, why do these tests have to be ridiculous? Anyway, side tangent there, but there’s something even more exciting than going back to school. Please note the photos used in this post utilize my custom Lightroom preset, which is applied to all my photos on Instagram. Ulta Beauty. Yes, new makeup is always exciting. 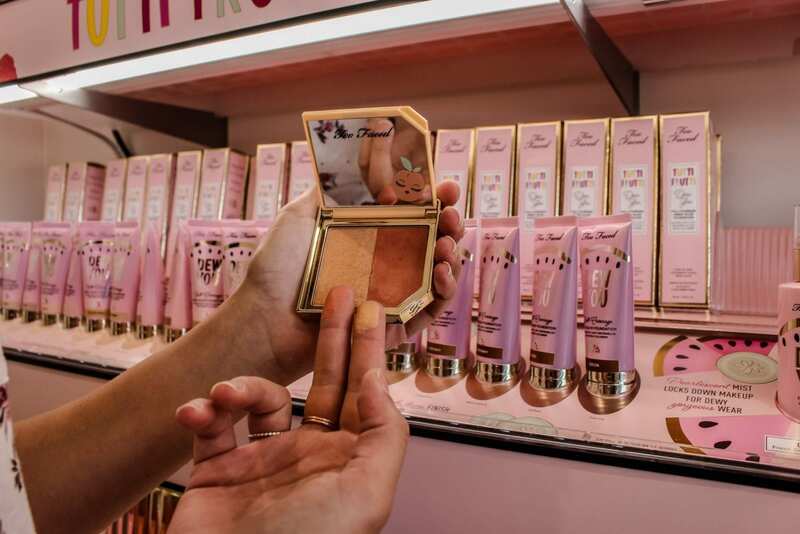 This time a complete collection exclusive to Ulta Beauty from Too Faced is available for purchase. The Tutti Frutti collection is honestly the cutest. The colors, the bright labeling and the smell of every single product is incredible. This may be the best collection from Too Faced to date. We’re looking at a new foundation, new lip formulations, new blush and highlighter duos, some new eyeshadow palettes and some concealers to compliment the new foundation. Everything smells delightful. Whether it’s peaches, chocolate, or candy, the theme of the smell fits the theme of the product. If you know anything about me in particular, I am all about scent. When it comes to something smelling delightful and it’s makeup, I am 100% for it. This foundation formulation is different from the existing Too Faced foundation. This has a medium consistency, but it’s not heavy coverage, which I love. I am in the phase where I’m looking for light coverage because I want my skin right. If my skin is looking good, there shouldn’t really be a need to have a heavy and thick foundation to cover everything. When it comes down to it, this is a foundation I have genuinely reached for day after day, and I love that it’s not overly heavy on the skin. All the powder products are incredibly pigmented, which you can easily see from my swatches of the blush and highlighter duo compact. One swipe at the formulation, and you are in business and ready to light up the world with that highlight! One of the favorite things about Ulta Beauty (my friends know this so well) but I love the rewards program. For spending money in makeup heaven, you get literal money to spend on more makeup. Perfect way to feed the addiction. Most other beauty stores give you a coupon, or samples, but Ulta Beauty gives you the best gift of all. More $$ to spend on products you'll likely need in a few months. You can read more about the Ultamate Rewards Program here. I've been a member since the program started years ago! Have you had a chance to check out this collection at Ulta yet? It’s definitely worth the stop, so once you check it out, let me know your thoughts. Make sure to smell everything. Don’t worry about being weird and sniffing every single product. Totally normal when it’s Too Faced. Trust me on that. Also, you can thank me later.